The ancient Ilyushin of the state owned airline Air Koryo, which flies twice weekly from Beijing to the North Korean capital, is a time machine. 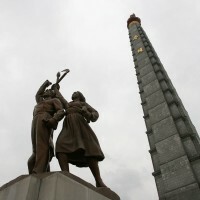 In the most inaccessible, most mysterious, most isolated country in the world, where even George Orwell would feel lost, the clocks stopped on the morning of 27thJuly 1953, when the representatives of the United Nations, China and the Democratic People’s Republic of Korea (DPRK) signed the Panmumjom armistice which ended three years of cold blooded massacres. The effects of the technological revolution, the capitalist market and globalisation have not touched the last outpost of the cold war. Behind the bamboo curtain, 23 million men, women and children are waiting for an American invasion. They are preparing to fight the final battle in a war that, legally, has never ended. Seen by night from the satellites and the Pentagon’s surveillance planes, the DPRK is a black hole: a dark mark surrounded by the bright lights of the Chinese and South Korean towns and cities. As you approach it appears less gloomy, at least in Pyongyang, the showpiece of the ‘workers’ paradise’ and the compulsory starting point of the first official visit of an Italian journalist. Mrs. Kim and Mr. Toh, kind but inflexible workers from the Ministry of Information, accompany me everywhere and the programme, planned down to the last detail, cannot be modified in any way. 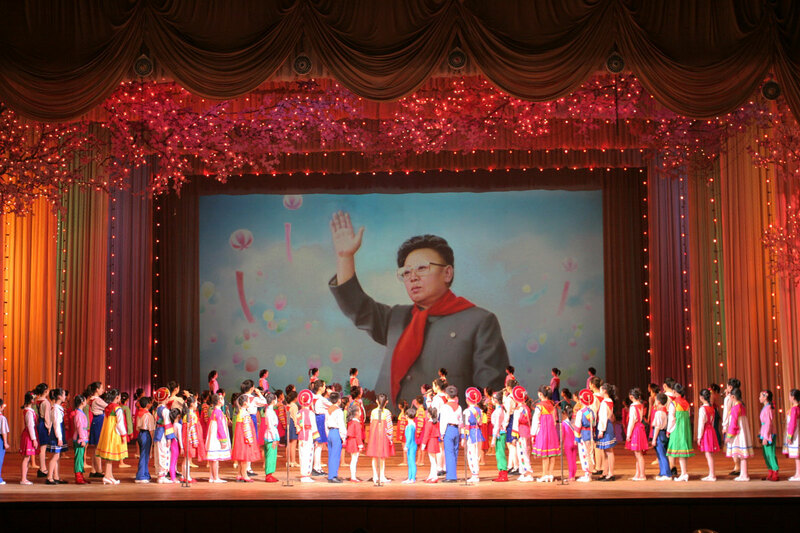 For example, I am not allowed to leave the Moranbong Hotel alone, where I am provided with a spotless room equipped with a television which transmits reassuring images: children playing the flute and zither, incredibly talented, dressed like living dolls; and Kim Jong-il, the Dear Leader, inspecting troops. News from the outside world: non existent. The September 11th attack was announced a week after the event. Pyongyang, built on the banks of the Taedong river, is like a futuristic city of the 1950’s: wide tree-lined avenues, immaculate squares and parks, geometric concrete buildings. The architecture underlines the success of the regime. 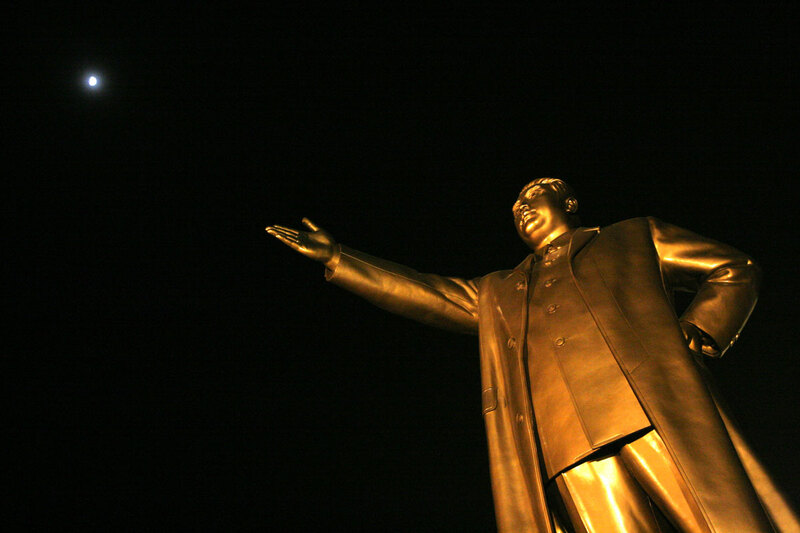 The bronze statue of Kim Il-sung, the Sun of the Nation, stands 45 metres high: the Great Leader, Father of the Nation and of the present Secretary of the Korean workers’ party and Supreme Commander of the Army, died in 1994, but has been declared President for Eternity. 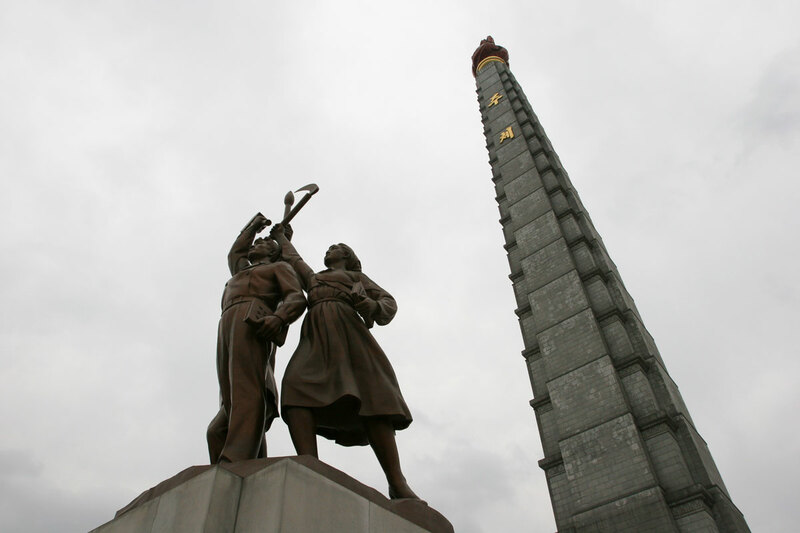 The awe-inspiring Juche Tower, 170 metres of granite, represents the absolutist hierarchycal ideology that penetrates the North Korean society: a unique mixture of nationalism, economic self sufficiency and Confucianism which seems to follow, with a religious fervour, the old maoist teaching “you must count only on your own forces”. In an imposing Exhibition Centre there is a never ending collection of bizarre flower arrangements in which only two species have been used: Kimilsungia, a lilac orchid named after the Great Leader by the Indonesian President Sukarno in 1965, and Kimjongilia, a red begonia created by a Japanese horticulturist on the occasion of the 46th birthday of the Dear Leader. 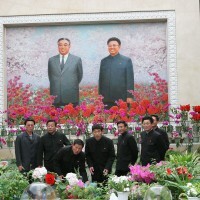 Schoolchildren on their school trips kneel before the portraits of the two Kims. The roads are semi deserted. At the crossroads attractive policewomen in immaculate uniforms direct the traffic of bicycles and pedestrians with robot like movements. There are very few cars, although Mr Toh assures me that the number of cars is on the rise and in December 2003 the first advertisement appeared on the road leading to the airport, in which a Huiparam, “the Whistle”, a sedan produced using Fiat parts imported from South Korea and built in Nampo, is highly praised. Price: 8,000 euros, an enormous sum of money when compared to the average wage of 20 euros a month. The city streets begin to bustle early morning, when the loudspeakers installed on the lampposts and in all the houses in the Hermit Kingdom (each also possessing an air raid shelter) emit shrill renderings of patriotic anthems and encourage the population to continue building a socialist state. Workers from all walks of life and students set off walking, often covering many kilometres, or patiently wait in silent, tidy queues for a the occasional ancient bus, the second hand trams provided by East Germany before the unification or the trains in the underground stations, bomb proofed against atomic attacks and decorated with celebratory mosaics. In the afternoon the squares fill with young people. 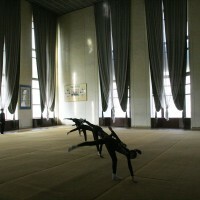 After school, the best and most deserving join in the daily training sessions to prepare them for the next Arirang Mass Games: spectacular muscular exhibitions in which more than 100,000 athletes can take part (preparations for the last edition required the equivalent of 200 million working hours). 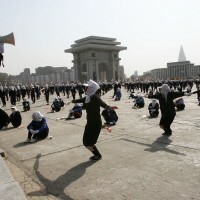 In the parks, in the area surrounding the Museum of the Revolution and in front of the May Day Stadium, thousands of youngsters train incessantly, guided by their instructors who give orders through loudspeakers. 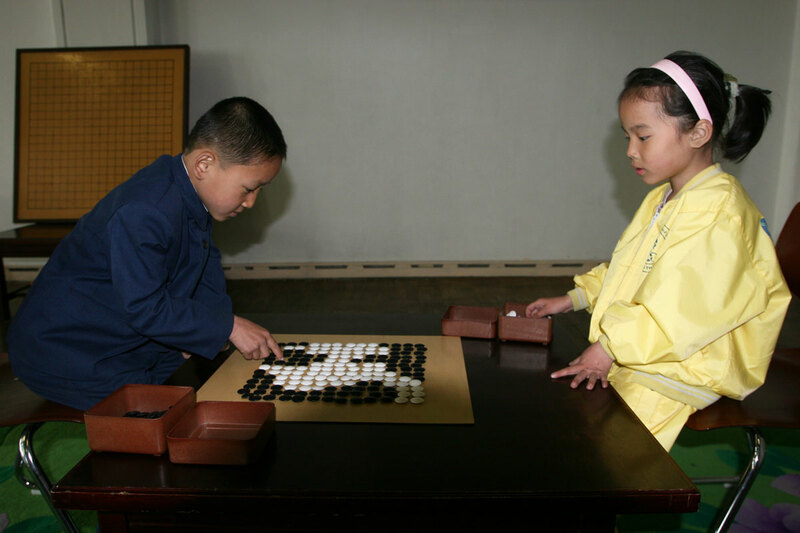 The games are a plastic expression of the ideals of the regime. In order to obtain perfect synchronization and refine the movements that bind the group together, the individual must give up his personal identity: the mass must behave as a single organism, obeying without question the instructions conferred. And this is also a means of keeping the people on the alert and mobilize a country which feels surrounded, excluded from the international community and in the sights of George W. Bush (who has included it in his Axis of evil). 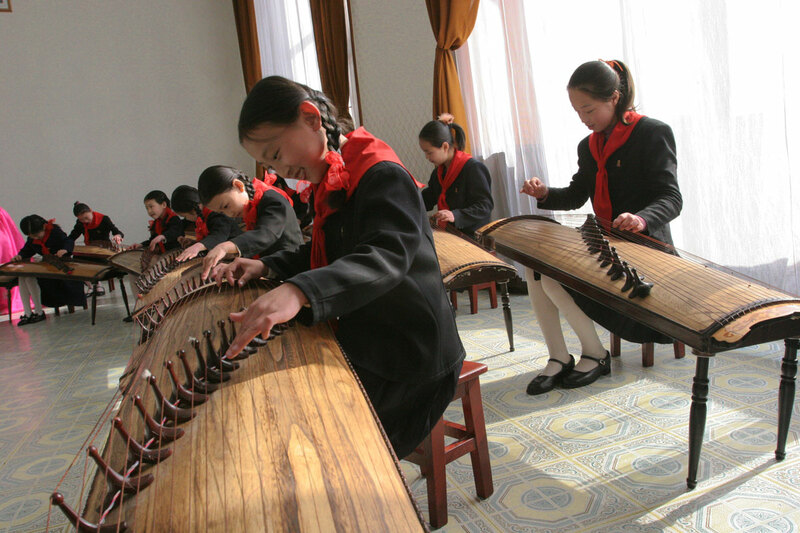 Kim Jong-il has launched the “songun chongchi” policy: the military first. The whole society is mobilized and organised giving priority to national defence: in fact more than a third of the national budget and a large part of the 22 billion dollars GNP are spent on this. Compulsory military service lasts for between 6 and 10 years. 1.1 million soldiers are on active duty, with another 4.7 million in the reserve and 120,000 men and women in the Special Forces, the biggest in the world. The 75 divisions of the Army, mainly positioned along the 246 kilometre DMZ between the two Koreas, have at their disposal 13,500 pieces of artillery and missiles, 5,800 tanks and armoured vehicles, 26 submarines, 780 Mig aircraft, 300 combat helicopters. The war industry is the only developed sector in the country’s economy and the only one that provides some hard currency through the export. 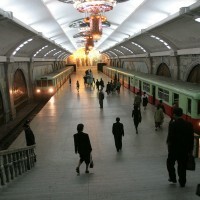 Whereas the nuclear programme, alongside the research of the possible uses for civil purposes, has already begun moving towards the production of arms: on February the 10th the DPRK announced that it had already produced several atomic warheads and, according to American sources, is preparing for its first underground test. Certainly the hard line taken by the White House has not yielded results. The Clinton administration was working on an agreement that foresaw the freezing of plutonium production in exchange for oil and civil nuclear technology. 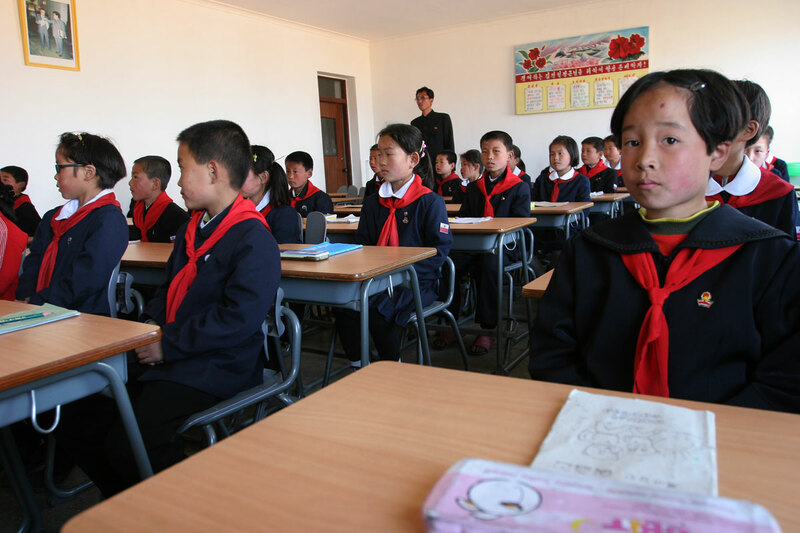 By refusing every bilateral confrontation, Bush has forced Pyongyang into a corner, speeded up the re-arming process and strengthened the monolithic regime of Kim Jong-il, in which there is no sign of a crack despite the obvious economic troubles. After sundown the capital empties and sinks into shadow. 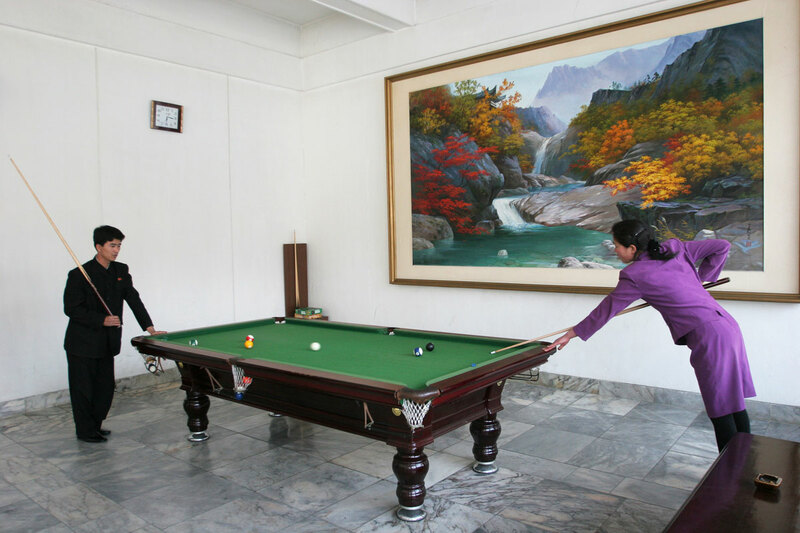 Lights flicker only by the monuments and government buildings, tourist hotels, houses in the diplomatic zone, the casino in the basement of the Yongakto Hotel where the few foreign clients at the roulette tables kill the night boredom with imported whisky and Chinese entraîneuses. The lack of electricity - and of heating - is a huge problem in winter, when temperatures of -20° Celsius are common and the only fuel available is timber: whole forests are chopped down and so, in the spring, young pioneers wearing red neckerchiefs plant millions of fast growing trees. In the countryside even lorries use wood as fuel, thanks to an ingenious system of steam power applied to the engine. Outside Pyongyang we travel through a country that has gone back to a pre-industrial era, through a landscape littered with observation towers, anti aircraft positions and bunkers hidden on the mountain slopes. Many districts are off limits: military zones, some probably housing prisons and re-educational camps. The roads are unmade and the short sections that have been tarmac-ed are used as landing strips for the Migs. The downfall of the Soviet Empire, the lack of spare parts and investment, the collapse of the transport system have all led to the downfall of the heavy industry, the old backbone of the economy. Only 14% of the land is good for agriculture; and this, together with the floods and the famines of the 90’s (one million dead), have obliged the government, against its will, to accept international aid. “Every day” says Richard Ragan of the WFP “we provide 6.5 million rations of highly enriched food, which are distributed through the state distribution network. It is an essential integration: the 400 grams of rice that the government provides are not sufficient at all”. According to Pierette Vu Thi, the UNICEF representative, malnutrition rates have gone down from 60% to 40%, but they are still alarming. 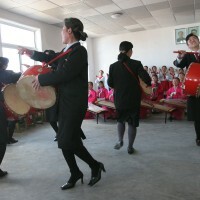 “The reasons of our sufferings are the present US sanctions and the imperialistic politics in Washington” my guides recite, while pointing out DPRK’s achievements in the social services: free houses and medical care, 99% of the population are literate, free pension schemes, no taxes, AIDS and crime nowhere to be seen. 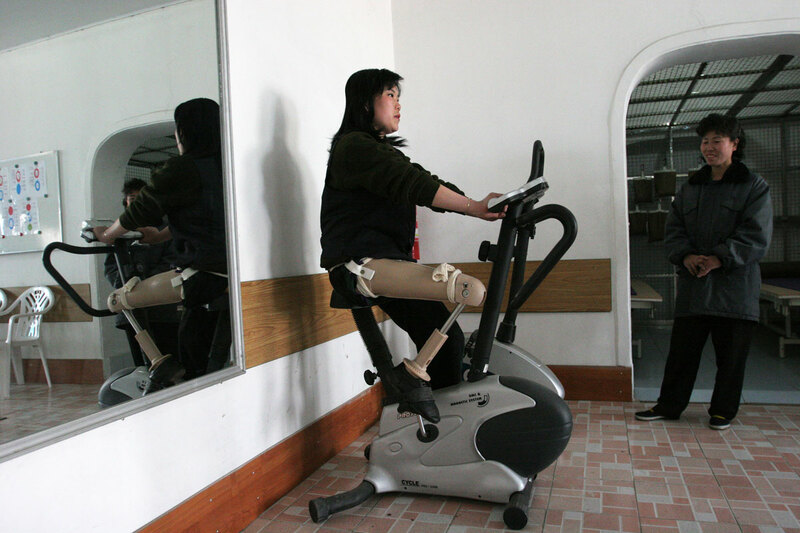 But in the far Eastern province of Wonsan, the only maternity hospital, with 250 beds, was built with Italian help. 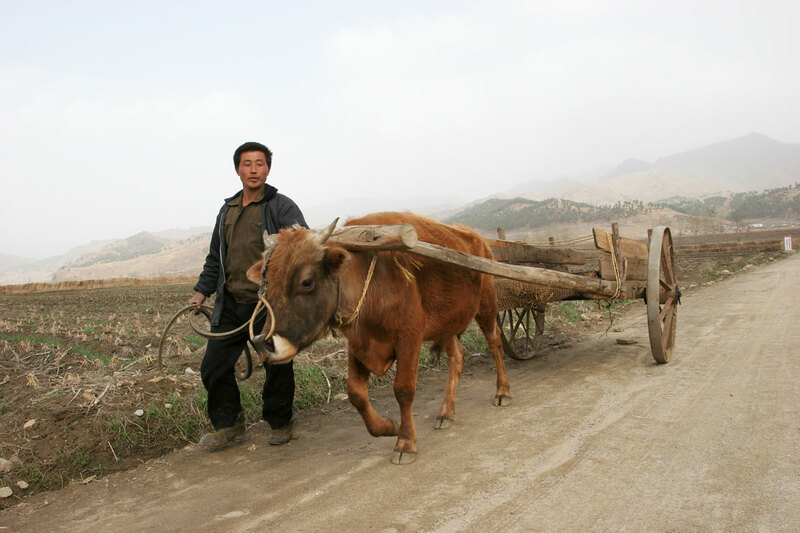 And in nearby Pangsjo county, according to Ri Yong Kil, a party delegate, the only tractor was donated by Cesvi, an NGO based in Bergamo (Northern Italy) which is presently engaged in helping seven agricultural cooperatives in that district. 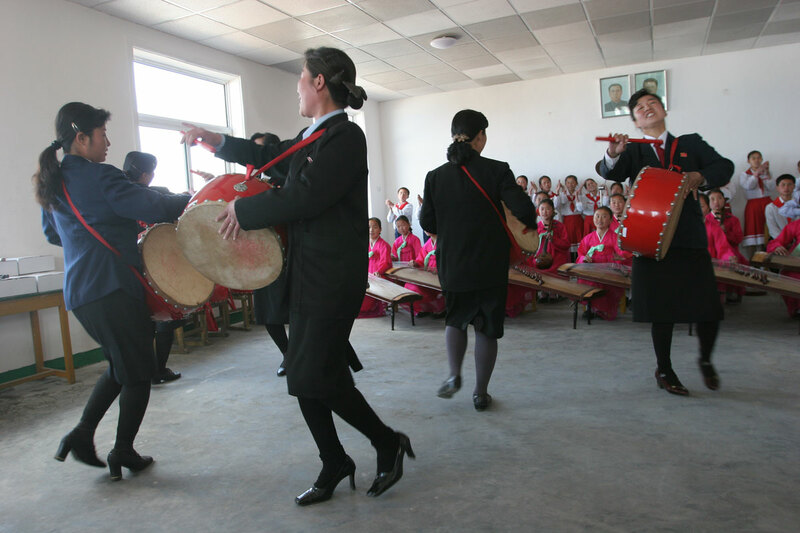 Part of the humanitarian aid from abroad has been used to rebuild the schools and houses in Ryongchon, a town on the Chinese border, where the elders of the local council, while sipping rice liquor and chewing kimchi, fermented cabbages, reminisce about the horrific blast on April 22, 2004, mistaken by American intelligence for a nuclear test, in which the village was destroyed: 161 people died and 3,000 were injured when 2 trains loaded with ammonium nitrate collided and exploded. 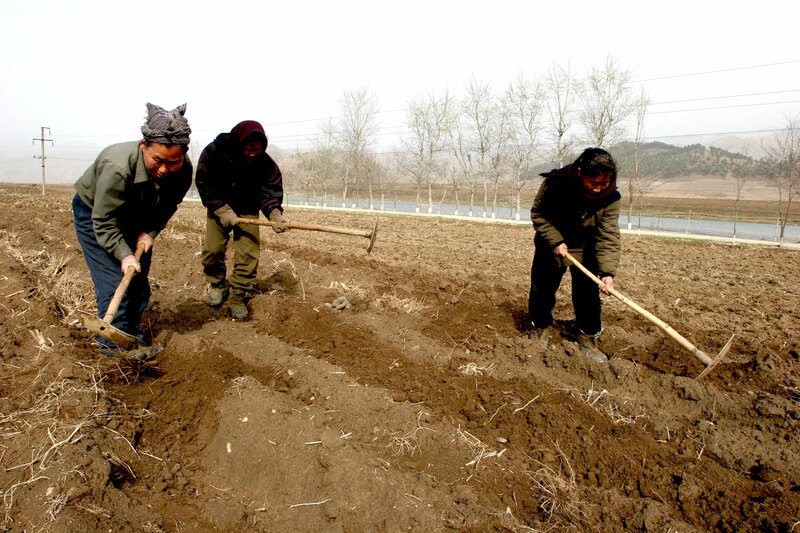 Moving back towards Pyongyang, we see peasants and soldiers working side by side in the paddy fields surrounded by red flags fluttering in the breeze, and it is a reminder of China during its catastrophic Great Leap forward. Even so, in this hermit Kingdom, something is changing if Kim Chun Guk, an official from the Ministry of Foreign Affairs, tells that “we are sending groups of experts to Europe to study how Western economies work.” And in July 2002 Kim Jong-il himself dared to open a breach into the strict system of centralised planning. 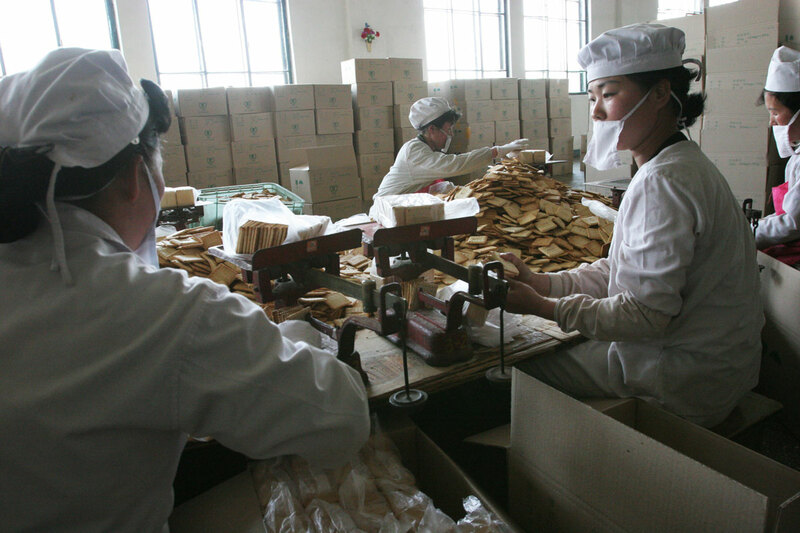 In fact the government has announced a series of innovative moves: the abolition of some subsidies to state owned companies, the reduction of price control, a partial adjustment of the exchange rates, permission for farmers to sell their surplus goods in informal markets. Suddenly wages have risen, although they still can’t catch up with the sharp rise in inflation, and consequently people are spending more. 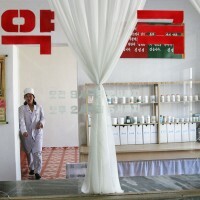 At the market in Tongil, a suburb on the outskirts of the capital, housewives pay in cash, no longer with food coupons. On the stall which sells electrical goods there is everything, from flat screened televisions to DVD players, cell phones and MP3 players, although it isn’t clear who can afford these luxuries. It is even more difficult to foresee the long term effects of this economic adjustments. 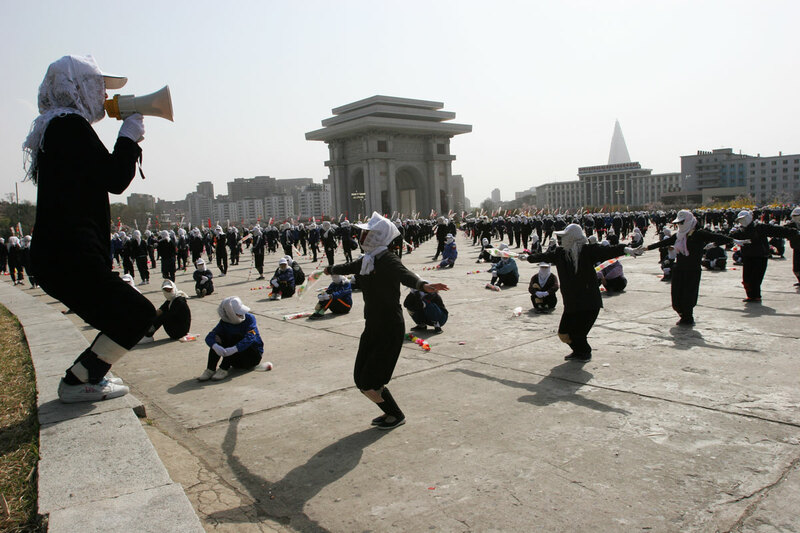 The hardliners keep saying that “the DPRK will not follow the move towards capitalism like Vietnam and China”. But meanwhile, with the blessing of the Dear Leader, the first worrying (or welcome) cracks are starting to appear in the bamboo curtain. Il vecchio Ilyushin della compagnia di stato Air Koryo, che due volte la settimana collega Pechino alla capitale nordcoreana, è una macchina del tempo. Nel paese più isolato, più misterioso e più inaccessibile del mondo, dove persino Orwell si sentirebbe smarrito, gli orologi sono ancora fermi alla mattina del 27 luglio 1953, quando i rappresentanti delle Nazioni Unite, della Cina e della Repubblica popolare democratica di Corea (Rpdk) firmarono a Panmunjom l’armistizio che pose fine a tre anni di spaventosi massacri. La rivoluzione informatica, il mercato capitalista, la globalizzazione non hanno lambito l’ultimo avamposto della guerra fredda. Oltre la cortina di bambù, 23 milioni di uomini, donne e bambini sono convinti che un’invasione americana sia imminente. E si preparano a combattere la battaglia decisiva di un conflitto che, in termini giuridici, non si è mai concluso. Vista di notte dai satelliti e dagli aerei spia del Pentagono la Rpdk è un buco nero: una macchia scura circondata dalle luci sfavillanti delle metropoli cinesi e sudcoreane. 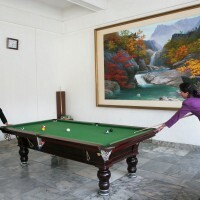 Da vicino appare meno tenebrosa, almeno a Pyongyang, vetrina del “paradiso dei lavoratori” e punto di partenza obbligato per la visita del primo giornalista italiano ufficialmente accreditato. La signora Kim e il signor Toh, gentilissimi e inflessibili funzionari del ministero dell’Informazione, mi accompagnano ovunque e il programma, stabilito nei minimi dettagli, non ammette deroghe. Non prevede, per esempio, che mi allontani da solo dall’hotel Moranbong, dove alloggio in una linda cametta con un televisore che trasmette immagini rassicuranti: bambine che suonano flauti e cetre, mostruosamente brave, vestite come confetti colorati; e Kim Jong-il, il Caro leader, che passa in rassegna un reparto dell’esercito. Notizie dal mondo esterno: nessuna. La tragedia dell’11 settembre è stata annunciata con una settimana di ritardo. Pyongyang, costruita sulle rive del fiume Taedong, ha l’aspetto di una città futurista degli anni Cinquanta: larghi viali alberati, piazze e giardini scrupolosamente curati, geometrici blocchi d’appartamenti in cemento, monumentali archi di trionfo, teatri e biblioteche, stadi sportivi da 150 mila posti. L’architettura esalta i fasti del regime. 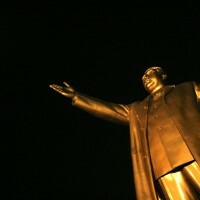 La statua bronzea di Kim Il-sung, il “sole della nazione”, è alta 45 metri: il Grande leader, padre della patria e dell’attuale segretario generale del Partito dei lavoratori, nonché comandante supremo delle forze armate, è deceduto nel 1994, ma è stato dichiarato “presidente per l’eternità”. La vertiginosa Torre della Juche, 170 metri di granito, è intitolata alla totalizzante ideologia gerarchica che permea la società nordcoreana: un singolare amalgama di nazionalismo, collettivismo autarchico e tradizione confuciana che traduce, con accenti quasi religiosi, l’appello maoista a “contare sulle proprie forze”. Un palazzo delle esposizioni di ciclopiche dimensioni raccoglie un’interminabile sequenza di fantasmagoriche composizioni floreali. 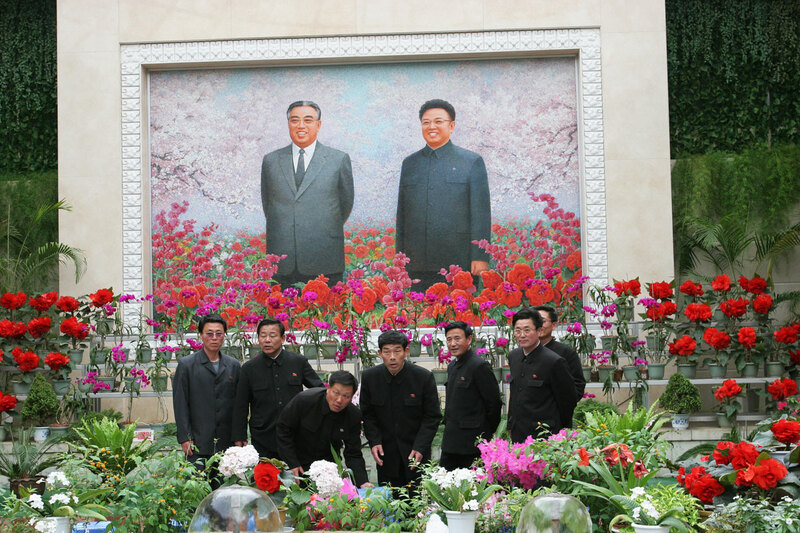 Ma i fiori sono solo due: la Kimilsungia, un’orchidea violetta così battezzata nel ’65 dal presidente indonesiano Sukarno per onorare il Grande leader, e la Kimjongilia, una begonia rossa creata da un floricultore giapponese per il 46° compleanno del Caro leader. Le scolaresche in gita s’inchinano davanti ai ritratti sorridenti dei due Kim. Le strade sono semideserte. Agli incroci avvenenti poliziotte in divisa immacolata dirigono con gesti da automa un traffico di pedoni e biciclette. 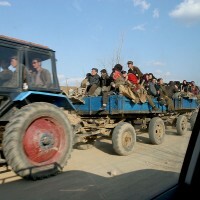 Poche le automobili, anche se il signor Toh assicura che il loro numero è in aumento e se la prima pubblicità commerciale apparsa nel dicembre 2003 a Pyongyang, visibile sul viale dell’aeroporto, decanta i pregi della Huiparam, “lo zufolo”, una berlina assemblata nel porto di Nampo con componenti Fiat importati dalla Corea del Sud. Prezzo: 8 mila euro, un’enormità a fronte di salari medi mensili che non superano i 20 euro. Le vie della città si animano al mattino presto, quando gli altoparlanti installati sui lampioni e in tutte le case del Regno eremita (ognuna provvista di rifugio antiaereo) diffondono squillanti inni patriottici ed esortano il popolo a proseguire l’edificazione dello stato socialista. Operai, impiegati, manovali, studenti si mettono in marcia, spesso percorrendo a piedi molti chilometri, o attendono in file silenziose e ordinate i rari e vetusti autobus, i tram di seconda mano regalati dalla Germania orientale prima della riunificazione tedesca o i convogli della metropolitana nelle stazioni a prova di atomica tappezzate di mosaici celebrativi. Le piazze si riempiono di giovani nel pomeriggio. 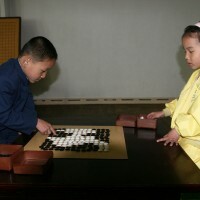 Dopo l’orario scolastico, i più capaci e meritevoli prendono parte ai quotidiani allenamenti in vista dei prossimi Giochi di massa Arirang: spettacolari esibizioni atletiche che coinvolgono oltre centomila ginnasti e che, nell’ultima edizione, hanno richiesto un impegno pari a 200 milioni di ore lavorate. Nei parchi, sulla spianata del museo della Rivoluzione e davanti allo stadio Primo maggio, migliaia di ragazzini si esercitano senza sosta, sotto la guida di istruttrici armate di megafoni. I Giochi sono la rappresentazione plastica dell’ideologia del regime. Per ottenere la sincronia assoluta e raggiungere la perfezione dei movimenti all’unisono, l’individuo deve annullarsi nel gruppo: la massa deve agire come un unico organismo, scattando con incondizionata disciplina al ritmo dei comandi impartiti. E’ anche un modo per mantenere alto il livello di mobilitazione di un paese che si sente accerchiato, bandito dalla comunità internazionale e nel mirino di Geroge W. Bush, che lo ha incluso nell’asse del male degli “stati canaglia”. Kim Jong-il ha lanciato la parola d’ordine “songun chongchi”: lo sforzo bellico prima di tutto. L’intera società è militarizzata e organizzata in funzione della difesa nazionale, che assorbe oltre un terzo del bilancio e gran parte dei 22 miliardi di dollari del pil. La leva obbligatoria dura dai sei ai dieci anni. I soldati in servizio attivo sono 1,1 milioni, 4,7 milioni sono i riservisti e 120 mila i membri delle forze speciali: le più numerose al mondo. Le 75 divisioni dell’esercito, schierate soprattutto lungo i 246 chilometri della Zona smilitarizzata al confine tra le due Coree, dispongono di 13.500 pezzi d’artiglieria e batterie di missili, 5.800 carri armati e mezzi blindati, 26 sommergibili, 780 Mig, 300 elicotteri da combattimento. L’industria bellica è l’unico settore sviluppato dell’economia e il solo che, attraverso l’export, garantisce introiti in valuta. Mentre il programma nucleare, accanto alla ricerca per usi civili, ha da tempo imboccato il tunnel della produzione militare: il 10 febbraio la Rpdk ha annunciato di possedere un numero imprecisato di testate atomiche e, secondo fonti americane, starebbe allestendo un primo test sotterraneo. Si tratta di una minaccia reale o di una complessa e rischiosa strategia per alzare la posta delle trattative diplomatiche a distanza con l’Occidente? L’assenza di informazioni verificabili legittima qualsiasi ipotesi. L’ex capo della Cia in Corea del Sud ed ex ambasciatore a Seoul Donald Gregg ha ammesso che l’intelligence di Washington brancola nel buio e ha definito la Rpdk “il più macroscopico fallimento nella storia dello spionaggio americano”. Certo è che la linea dura della Casa Bianca non ha ottenuto effetti positivi. L’amministrazione Clinton stava lavorando a un accordo che prevedeva il congelamento della produzione di plutonio in cambio della fornitura di petrolio e tecnologia nucleare civile. Rifiutando ogni contatto bilaterale, Bush ha spinto Pyongyang su posizioni più intransigenti, col risultato di accelerare la corsa al riarmo e di rafforzare il monolitico regime di Kim Jong-il, nel quale non si intravede alcun segno di cedimento, nonostante le evidenti difficoltà economiche. Dopo il tramonto la capitale si svuota e affonda nella penombra. Restano accese le luci dei monumenti e dei palazzi del potere, degli alberghi per turisti, di qualche ristorante, delle residenze nel quartiere diplomatico (che ospita sette italiani), del casinò nel seminterrato dell’hotel Yongakto dove ai tavoli della roulette i pochi clienti stranieri ammazzano la noia con il whisky e le entraineuse cinesi. La carenza di energia elettrica e di riscaldamento è pesante d’inverno, quando il termometro scende a meno venti e la legna è il solo combustibile a portata di mano: intere foreste vengono tagliate e i pionieri col fazzoletto rosso al collo piantano ogni primavera milioni di alberi ad accrescimento rapido. Anche i camion, nelle campagne, vanno a legna, grazie a un rudimentale e ingegnoso sistema di caldaie a vapore. Fuori da Pyongyang si viaggia in un paese regredito all’età preindustriale, in un paesaggio costellato di torrette di avvistamento, postazioni di contraerea e bunker mimetizzati nei fianchi delle montagne. Molti distretti sono off-limits: zone militari, forse riservate ai campi di rieducazione. Le strade sono sterrate e i brevi tratti asfaltati sono piste di atterraggio per i Mig. Il crollo dell’Impero sovietico, la scarsità di pezzi di ricambio e di investimenti, il collasso del sistema dei trasporti hanno distrutto l’industria pesante, spina dorsale dell’economia. Con un’agricoltura che dispone di un misero 14 per cento di terre coltivabili, le inondazioni e le carestie degli anni Novanta (un milione di morti) hanno costretto il governo a ricorrere, di malavoglia, agli aiuti internazionali. “Ogni giorno” dice Richard Ragan, del Wfp, “consegnamo 6,5 milioni di razioni energetiche attraverso il capillare sistema di distribuzione statale. E’ un’integrazione indispensabile: i 400 grammi di riso che passa il governo non sono sufficienti”. Secondo Pierrette Vu Thi, dell’Unicef, il tasso di malnutrizione è sceso dal 60 al 40 per cento, ma è ancora allarmante. “Colpa delle sanzioni e della politica imperialista di Washington” recitano le mie guide, che sottolineano le conquiste sociali della Rpdk: casa e sanità gratuite, alfabetizzazione al 99 per cento, pensioni garantite, niente tasse, aids e criminalità inesistenti. Ma a Wonsan, l’unico ospedale materno da 250 letti è stato realizzato dalla cooperazione italiana. E a Pangsjo, racconta Ri Yong Kil, il delegato del partito, l’unico trattore è stato fornito dal Cesvi, l’ong bergamasca impegnata nella riabilitazione di sette aziende agricole della contea. “L’Italia” spiega Massimo Urbani, responsabile della Cooperazione a Pyongyang, “è stato il primo paese del G-7 a riconoscere la Rpdk. Abbiamo erogato aiuti economici e umanitari per oltre 2,6 milioni di euro, destinati a progetti di sviluppo e alle agenzie dell’Onu”. Una parte dei fondi è servita alla ricostruzione di scuole e abitazioni rase al suolo a Ryongchon, cittadina al confine cinese dove gli amministratori locali, sorseggiando acquavite di riso e masticando “kimchi”, cavoli fermentati, rievocano la spaventosa detonazione del 22 aprile 2004, scambiata dall’intelligence americano per un test nucleare: 161 morti e 3 mila feriti, nell’esplosione di due treni carichi di nitrato di ammoniaca. 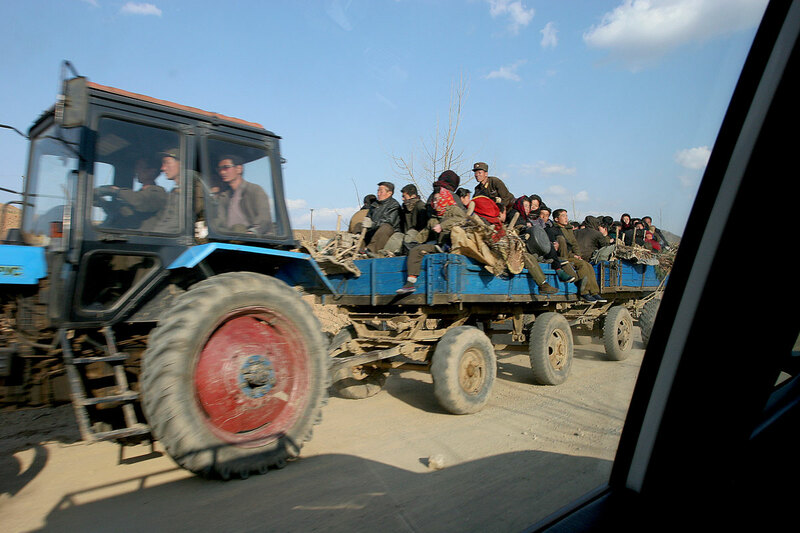 Tornando verso Pyongyang, osservando le mondine e i militari irreggimentati nelle risaie in uno sventolio di bandiere rosse, sembra di vedere la Cina ai tempi del catastrofico Grande balzo in avanti. Eppure, anche nel Regno eremita, qualcosa sta cambiando se Kim Chun Guk, alto funzionario del ministero degli Esteri, confida a Panorama che “stiamo mandando in Europa decine di esperti per studiare i meccanismi dell’economia occidentale”. 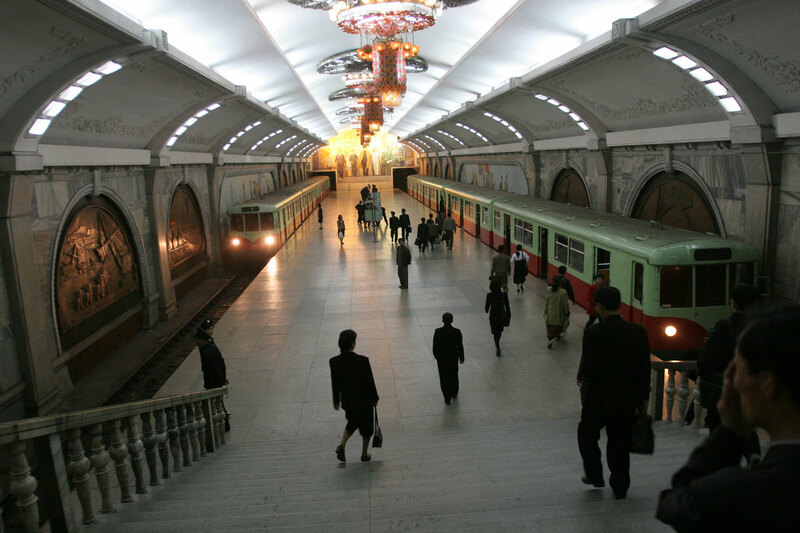 E se dal luglio 2002 Kim Jong-il ha osato aprire una breccia nel rigido sistema della pianificazione centralizzata. Il governo ha infatti annunciato un pacchetto di misure senza precedenti: abolizione dei sussidi alle imprese statali, incentivi alla produzione, liberalizzazione controllata dei prezzi e del tasso di cambio, possibilità per i contadini di vendere il surplus nei mercatini informali. Di colpo i salari sono aumentati, anche se non tengono il passo dell’inflazione, salita alle stelle. E i consumi sono cresciuti. Al mercato di Tongil, un sobborgo della capitale, le massaie pagano in contanti, non più con le tessere alimentari. Sui banchi dell’elettronica si trova di tutto, dai televisori al plasma ai lettori di dvd, benché non sia chiaro chi possa permettersi simili lussi. Ancora più arduo è divinare l’impatto a lungo termine degli “aggiustamenti economici”. I paladini dell’ortodossia ripetono che “la Rpdk non seguirà la deriva capitalistica del Vietnam e della Cina”. Ma intanto, con il beneplacito del Caro leader, nella cortina di bambù sono apparse le prime, seducenti, insidiose crepe. Tra il Paese dei morti viventi e il paradiso la linea di confine è il Tumen, un fiumiciattolo che si snoda tra i boschi e i campi di grano in una remota provincia della Manciuria meridionale. Han Guang l’ha appena attraversata, di notte, dopo un lungo viaggio, e ora assapora il gusto acre del suo paradiso nell’affumicata stamberga di un villaggio cinese: tabacco fresco arrotolato in carta di giornale, anguria e kimchi, cavoli sottaceto. Han deve nascondersi: è un fuggiasco, uno dei centomila emigranti affamati che hanno abbandonato casa e famiglia nel disperato tentativo di racimolare qualche soldo oltrefrontiera. L’incontro si svolge in un “luogo sicuro”, dopo estenuanti trattative con un intermediario e dopo molti giri in auto per depistare la polizia. Han ha paura: se lo scoprono rischia la deportazione, mesi o anni di prigione, rappresaglie contro i figli. Accetta di parlare perché si sappia quel che avviene “dentro”, nel Paese dei morti viventi che chiamano Corea del Nord. “Ho 59 anni, ma so che ne dimostro ottanta” dice accendendo un’altra sigaretta. Ha il volto scavato, dita ossute e sottili, i piedi coperti di piaghe. “Quando non uccide, la fame invecchia”. Indossa pantaloni rattoppati, una giacca sdrucita e scarpe di tela senza lacci. Non possiede altro. “Ho ricevuto l’ultima razione di cereali in giugno, meno di 8 chili di riso per 6 persone: è durata tre giorni. Una delle mie bambine era già morta. 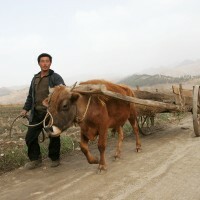 Io lavoravo in un allevamento di pesci a Huan Hai Dao, nel sud, ma ho perso il posto nel ‘96. Anche mia moglie e altri tre figli sono disoccupati: le fabbriche chiudono per mancanza di combustibile e di materie prime. La ragazza più grande insegna in una scuola elementare, ma è senza paga dalla primavera scorsa. Prendeva 90 won al mese (500 lire, ndr. ): una camicia vale quattro mesi di salario”. Frammenti di vita. Racconti di profughi che nessuno è in grado di verificare: ma pur sempre fessure nel muro di silenzio, spiragli da cui filtrano brandelli di una realtà sepolta da decenni di follia ideologica. La Corea del Nord, ultimo bastione di un comunismo integralista e autarchico che contempla, caso unico nella storia, la trasmissione per via dinastica del potere taumaturgico del Grande Leader, ha chiuso da quasi mezzo secolo le porte al mondo esterno. Nel regno del cinquantasettenne Kim Jong Il, degno erede di Kim Il Sung, padre della patria e inventore della juche, la delirante “teoria fondamentale” elevata a religione di stato, il privilegio di un visto d’ingresso è riservato ai diplomatici dei pochi paesi che hanno mantenuto rapporti con Pyongyang, a uno sparuto drappello di volontari delle organizzazioni umanitarie e di rappresentanti delle agenzie dell’Onu, ad alcuni turisti e uomini d’affari di passaggio, a qualche giornalista gradito al regime. Tutti sorvegliati e controllati, in ogni spostamento, dai servizi di sicurezza interni. “La carestia” continua Han “cominciò a farsi sentire agli inizi degli anni Novanta, quando Russia e Cina tagliarono le forniture di petrolio, di fertilizzanti e di generi alimentari e il governo decise di ridurre le razioni di cereali da 167 a 107 chili all’anno a testa: un quantitativo irrisorio. 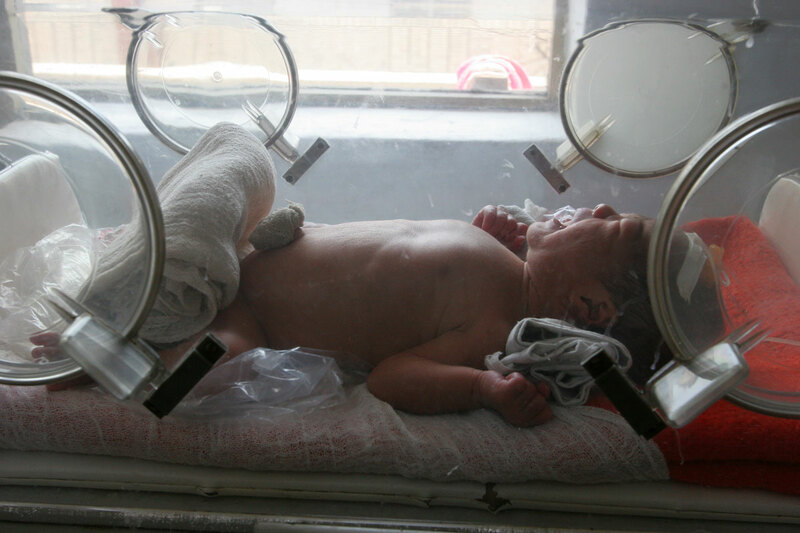 I primi a cedere furono i malati, i neonati e i disabili. C’erano vecchi che si lasciavano morire per risparmiare alle famiglie il peso del loro mantenimento. La situazione è via via peggiorata, aggravata dalle inondazioni, dai cattivi raccolti e dal fallimentare sistema dell’agricoltura collettivizzata. L’unico modo per sopravvivere è andare in montagna a coltivare patate e vendere di nascosto i prodotti della terra. Ma alcuni mesi fa anche i mercati liberi dei contadini sono stati chiusi. Siamo costretti a nutrirci di radici, erbe selvatiche e cortecce”. Tra i rifugiati circolano orripilanti storie di cannibalismo: giovani giustiziati per aver venduto carne umana; orfani e bambini di strada rapiti, uccisi e divorati; cadaveri tagliati a pezzi e consumati nelle case. Forse solo fantasie, o episodi isolati. Anche il numero totale delle vittime della carestia è oggetto di dibattito e di roventi polemiche tra le agenzie dell’Onu e le organizzazioni umanitarie private. Ma le stime più attendibili sono agghiaccianti: da 2 a 3 milioni di nordcoreani, su una popolazione di 23 milioni, sarebbero morti negli ultimi 5 anni di fame e di malattie provocate dalla denutrizione. 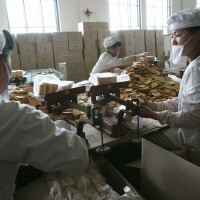 I rapporti del Programma alimentare mondiale, dell’United States Institute of Peace e della John Hopkins University School of Public Health, aggiornati all’agosto del 1999, concordano nel ritenere che oltre due terzi dei bambini al di sotto dei sette anni siano affetti da malnutrizione, che il tasso di natalità sia crollato del 50 per cento in soli tre anni e che la speranza di vita sia scesa a 59,8 anni per gli uomini e a 64,5 anni per le donne (limiti che in Corea del Sud raggiungono rispettivamente i 70,6 e i 78,1 anni). “Mentre noi moriamo di fame” spiega ancora Han “i dirigenti politici e gli ufficiali dell’esercito vivono nel lusso, fanno acquisti in valuta nei negozi per la nomenklatura, viaggiano in Mercedes e limousine con i vetri scuri. In città come in campagna esistono due classi rigidamente separate: i ricchi, che sono i quadri del partito e delle forze armate, e i poveri, che sono tutti gli altri e che devono soltanto ubbidire. Tra i quadri e il popolo c’è la stessa differenza che c’è tra il cielo e la terra. Oggi persino i soldati fanno la fame e nessuno vuole più andare nell’esercito: la leva è obbligatoria anche per i figli unici e dura 10 anni, ma chi ha i soldi allunga una mazzetta e viene riformato. Tutti rubano, tutti sono corrotti: io, per passare il Tumen, ho pagato le guardie di frontiera”. Nanping è un villaggio di contadini poveri in una delle regioni più depresse della Cina. Per Han è il paese di Bengodi, una Mecca dei consumi e del capitalismo più sfrenato. Le bancarelle offrono frutta e verdura fresca, uova, polli, fagioli e pesce secco. Nelle taverne si servono leccornie come lo stufato di cane alle cipolle e lo spezzatino di serpente, innaffiati di birra e di acquavite di riso. Tagliando il mais Han guadagnerà 300 yuan al mese, 60 mila lire, e potrà tornare presto a casa. Ma dovrà fare attenzione. I cinesi di etnia coreana (oltre 2 milioni lungo i 1.300 chilometri del confine) che lo hanno accolto corrono seri pericoli: la multa per chi aiuta i fuggiaschi è salita a 5 mila yuan, il reddito di un anno di lavoro. E i controlli si sono intensificati, da una parte e dall’altra del fiume. Chi viene intercettato in territorio nordcoreano rischia la fucilazione per tradimento; più spesso finisce a tempo indeterminato nei famigerati “campi 927” (dalla data della loro istituzione, il 27 settembre 1997), i sovraffollati centri di detenzione per i “migranti senza permesso di viaggio”. Han ha fretta di concludere: “Sa quali sono le spiegazioni ufficiali della carestia? Le calamità naturali, le cattive tecniche agricole, le sanzioni economiche occidentali e, soprattutto, lo stato di guerra permanente con gli Usa. La radio continua a ripetere che l’attacco è imminente, questione di giorni o di settimane, che dobbiamo sostenere lo sforzo bellico stringendo la cinghia fino al 2004, che la liberazione della Corea del Sud dal giogo dell’imperialismo è inevitabile. E che gli alimenti regalati da Washington fanno dimagrire. Sembra di stare in un manicomio”. Per rendersene conto è sufficiente gettare lo sguardo di là dal fiume. 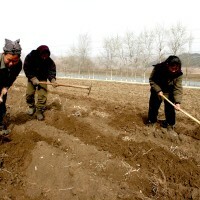 Sulle colline denudate da un’implacabile deforestazione, in un silenzio cimiteriale, svettano i megalitici ideogrammi con l’ode al Grande Leader Kim Jong Il, “sole del XXI° secolo”. Anche i pendii più scoscesi delle montagne sono coperti da minuscoli appezzamenti coltivati, ma i segni di vita sono quasi inesistenti: un treno merci carico di carbone è fermo a una stazione deserta; un decrepito autocarro che trasporta legname arranca su una strada sterrata; su un viottolo le contadine portano a spalla fascine e balle di fieno. Non un filo di fumo si leva dalle ciminiere delle poche fabbriche, che paiono abbandonate. Il Tumen segna anche un confine temporale: separa una Cina contadina e caotica, ma in rapida trasformazione, da una società statica, arcaica, surgelata. Al valico di frontiera, uno sbrecciato ponte di cemento in fondo al quale campeggia un grottesco ritratto della “Cara Guida” Kim Il Sung, alcuni nordcoreani muniti di lasciapassare radunano le provviste da consegnare ai parenti in attesa sull’altra sponda: casse di cibo e olio per cucinare, vestiti, scarpe, piccoli elettrodomestici. “Gli aiuti occidentali” dicono “sono accaparrati dai quadri del partito, dell’esercito e della polizia o sono smerciati alla borsa nera. Negli ospedali mancano i medicinali. E la corrente elettrica arriva a singhiozzo”. Yanji, la città più vicina (40 per cento della popolazione di etnia coreana), vive di commerci e di contrabbando con la Corea del Nord, dove numerose società cinesi hanno aperto uffici, soprattutto nella zona economica speciale istituita attorno al porto di Rajin. 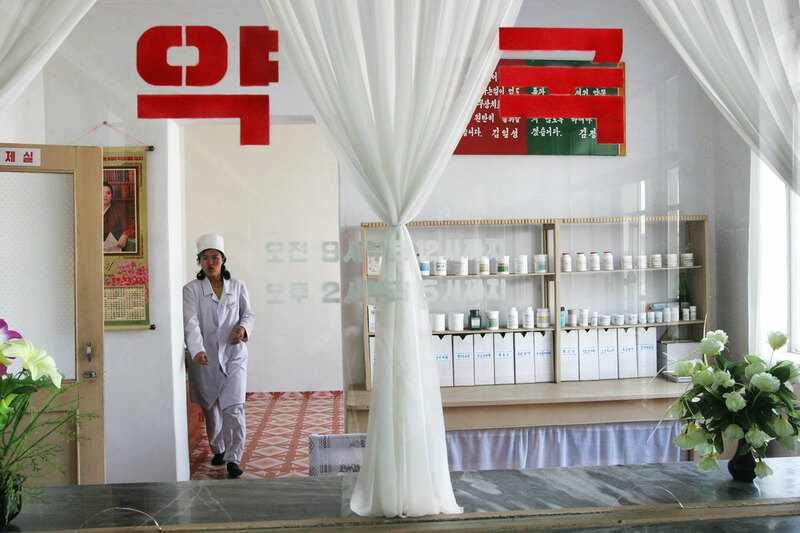 Pyongyang, nonostante la carestia, esporta grandi quantitativi di pesce e il mercato abbonda di gamberi e calamari congelati. D’estate voli speciali trasportano da Seoul migliaia di turisti sudcoreani che visitano il confine e affollano i 25 negozi e ristoranti aperti nella provincia dal governo del Grande Leader per incassare un po’ di valuta e spiare la “nazione amica” che ha imboccato la pericolosa strada del capitalismo. 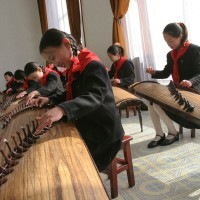 Come il ristorante Mulan, dove si beve cognac “made in North Korea”, si fumano sigarette Pyongyang e le cameriere in tailleur rosso fiamma e calze nere sfoggiano l’obbligatorio distintivo con la faccia di Kim Il Sung: lavorano in Cina per tre anni, sorvegliate da un commissario politico, e non rispondono ad alcuna domanda sul loro paese. Ma negli ultimi anni il volume degli scambi (riso, ginseng, legname e materiale ferroso contro mais cinese, abbigliamento e prodotti industriali) è precipitato da un valore di 310 milioni di dollari nel ’93 a meno di 32 milioni. I vicoli di Yanji sono pieni di bambini nordcoreani: orfani, abbandonati, o spediti in Cina a mendicare per alcuni mesi, dormono sui marciapiedi e scavano tra i mucchi di rifiuti in cerca di qualcosa da mangiare. La locale chiesa protestante offre due pasti caldi al giorno. Travestiti da turisti o da uomini d’affari, decine di missionari armati di telefonini e computer portatili pattugliano la regione dispensando aiuti e parole di conforto ai profughi illegali e organizzando l’invio clandestino oltrefrontiera di pacchi dono con cereali, sapone, medicine e una Bibbia tascabile. Un’attività perseguita dalle polizie su entrambe le sponde del Tumen. “Oggi è la Festa della luna” dice uno dei volontari laici della chiesa “e avranno anche il dolce. Sono in condizioni pietose: il 70 per cento è denutrito, quasi tutti hanno la scabbia, problemi intestinali e malattie respiratorie. I più piccoli hanno dieci, undici anni”. L’unico commercio in pieno sviluppo è la compravendita di ragazze nordcoreane. Destinate a un frettoloso matrimonio con un contadino cinese. O a lavorare negli squallidi bordelli e nelle sale di massaggi e di karaoke delle città della Manciuria. “È la prima volta che vedo da vicino un occidentale” dice intimorita Jin Hai, 29 anni, che si nasconde in un quartiere popolare di Yanji, in una buia stanza con le finestre rotte e un braciere per riscaldarsi. È arrivata in primavera da Ham Heng, nella Corea centrale, comprata da un intermediario per 200 dollari e rivenduta al doppio a un cinese che cercava moglie. E che tre mesi dopo l’ha cacciata, perché “costava troppo”. “Il mio primo ricordo” racconta “ è la sensazione della fame. In famiglia eravamo in sette, ma due fratelli e mio padre sono morti tre anni fa. Il periodo più duro è cominciato nel ’94. Gli alberi sembravano tutti betulle perché si staccava la corteccia per farla bollire con erbe e radici nella minestra, cui potevamo aggiungere qualche chicco di grano. Ma non serviva a niente, ti riempivi solo di acqua. Cercavamo rane, insetti e molluschi nei fossi. In città si prendeva persino l’erba delle aiuole e dei giardini. Sono venuta in Cina per non morire di fame”. Jin non era ancora sposata perché, dice, nessuna donna oggi vuole avere figli che non possono essere nutriti. Le famiglie si disgregano. “Non c’è lavoro” continua. “Le industrie sono paralizzate, tranne le fabbriche di armi e di munizioni necessarie per la liberazione del Sud. Anch’io ho perso il posto: dipingevo slogan sugli striscioni di propaganda e con un mese di salario riuscivo a comprare mezzo chilo di mais. Ma l’ultimo stipendio l’ho ricevuto nel ’94. 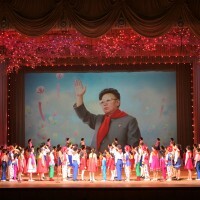 L’anno dopo anche le razioni sono cessate: le distribuivano solo in occasione dei compleanni di Kim Jong Il e di Kim Il Sung, il 16 febbraio e il 15 aprile”. Jin ha deciso di farsi comprare per aiutare i suoi a tirare avanti. Due sorelle pensano di fare altrettanto. È giunta in Cina attraverso molti passaggi gestiti da un “uomo d’affari” coreano e ha passato il confine tra Musan e Nanping in una notte di marzo. “Mio marito è un cinese han” racconta. “Mi ha lasciato perché gli chiedevo soldi per comprare provviste da mandare a mia madre, che avevo contattato per lettera e avevo fatto venire al confine di Tumen. Ora mi nascondo in casa di amici e campo alla giornata, mi basta un po’ di cibo e un vestito di ricambio. Non ho documenti, per averli bisogna pagare 10 mila yuan, e nessuno mi vuole assumere per paura della polizia”. Ma Jin, come centinaia di migliaia di rifugiati clandestini, ha deciso: nel Paese dei morti viventi, illuminato dal livido “sole del XXI° secolo”, non tornerà mai più.